Set right in the heart of the Battle of the Somme Remembrance trail, this place of Remembrance is a reflection of the great sacrifice made by the soldiers of the 36th Ulster Division. Take a walk in the little park surrounding the gothic tower before entering for a moment and taking a look at the curious combination of objects placed around the interior in honour of the sons of Ireland. Just outside the site you will find two of the most peaceful Commonwealth cemeteries on the Western Front. Like the Pals Battalions who joined up together to defend king and country on the front lines of the Somme, soak up the unique atmosphere of the Western Front battlefields here at this key monument on the Remembrance trail. Built in honour of the 36th Ulster Division, the gothic tower is a symbol of “Irish Pride” in a beautiful countryside setting just a stone’s throw from other major places of Remembrance. Standing proud between the Thiepval Memorial and Newfoundland Park, the Ulster Tower, more intimate than its neighbours, bears witness to the sacrifice made by the men of Ireland during the First World War. Surrounded by Commonwealth cemeteries, the site feels almost private in its countryside setting, a place to remember each one of the men of the 36th Ulster Division who fell in the fighting. 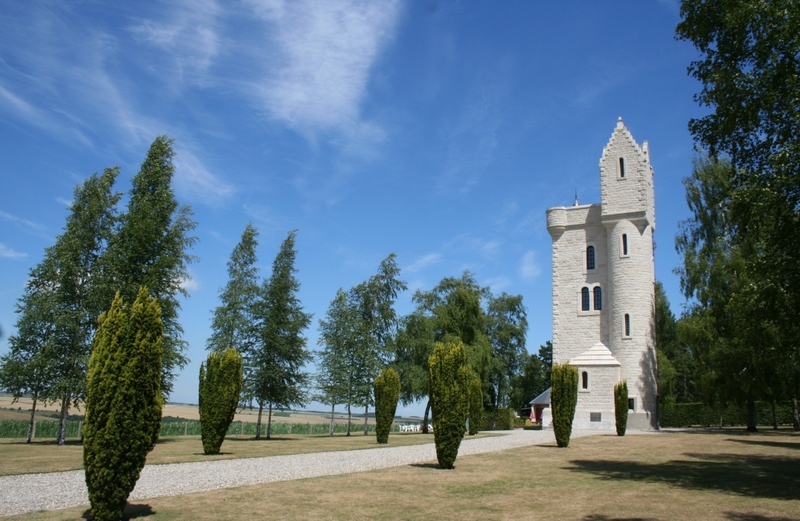 The Ulster tower is the replica of a tower located near Belfast in the training camp of the 36th Division that, on 1 July 1916, was caught in the crossfire of the German and British artillery. Irish monument for the Battle of the Somme. It is also a memorial to the soldiers from Ulster who perished during the Great War. Information centre, video room, shop, cafeteria.